-Jonny Gomes scored 4-runs and reached base all 5 times in the game. Ã‚Â He only had 1 official at-bat and singled. Ã‚Â He drew 4 walks in his other 4 plate appearances and was the first Reds player since 1977 to walk 4 times and score 4 runs in a game. -Yesterday, Drew Stubbs broke free from his slump and today Jay Bruce did the same. Ã‚Â Bruce went 3-4 with a double, walk, and 2 RBI. Ã‚Â His 2-out double in the first inning plated the first 2 Reds runs of the game. -Miguel Cairo went 2-6 with an RBI triple in the 9th inning. Ã‚Â Cairo’s triple sums up how the Cubs look right now. Ã‚Â On a routine fly ball to right field, Xavier Nady let the ball drift over his head and pop out of his glove. Ã‚Â The official scorer gave it a triple, but it should have been scored an error. -Juan Francisco and Ryan Hanigan had only 1 hit each, but both had 2 RBI. Ã‚Â Both of Hanigan’s RBI came via a sac-fly. Ã‚Â Hanigan may be the best player in the lineup when it comes to getting a runner in from third and less than 2 outs on this club. -Travis Wood was cruising along until the 7th inning. Ã‚Â He had surrendered only 1 hit and 1 walk through the first 6 innings but ran into trouble in the 7th. Ã‚Â He finished the game going 6.1 innings, allowing 4 runs (3 earned) on 4 hits and 2 walks. -The Reds swept the Stupid Cubs. Ã‚Â That was fun! Ã‚Â It was the first sweep the Reds had finished off since their sweep of Oakland back in late June. 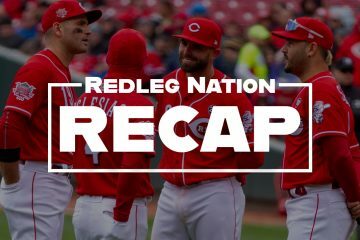 -The Reds are now 16 games over the .500 mark! Game Thread: Let’s sweep the stupid Cubs! They just called the STL/FLA game. I wonder who will catch Mike Leake tomorrow. Hernandez will catch on Tuesday (Cueto) and Hanigan will catch Wednesday (Arroyo). But both have been catching Leake. I hope it’s Hanigan, as he has been hitting better than Ramon, not to mention that he’s a better catcher. Bring on the Cardinals!!! I think we’re in a good position for this series. W/ 2 of their best pitchers going, the pressure is entirely on them to regain the ground they lost this weekend. For my money, the west coast trip coming up will be our make or break test. This series gets the fans all revved up, but it won’t affect our playoff chances. I think the Reds have found the left hander they’ve been searching for. Add to all this is that the Louisville Bats flat out are owning the International League despite giving up some of their best players to the Reds (and with no Gary Matthews, Jr. 😀 ). The Columbus Clippers are falling fast likely due to giving up ballplayers to the AAAA Cleveland Indians. And remember how bad they started off? 8-19. Nothing is like sweeping the Cubs! I think Wood has to be solid in the rotation no matter if Bailey and Harang come back. Pose starting attacking the ball again and hopefully it will continue, now all that’s left is finding that lost power. His backside stayed in which got him staying behind the ball and driving it instead of reaching. How excited are you for the Cards series? I haven’t been this excited in more than a decade. If the Reds can take 2 from the Cards it’s sweet, if they take one it’s acceptable. They are going right into the teeth of the Cards strength—playing 3 games—while the Reds strength is rotation depth. If they can come out of the 2nd Cards series a game or two ahead they’ve got a good chance. Obviously, the Tuesday game is the one the Reds have the best chance in. They’ve got to hit Garcia this time. Cards and Reds are about even teams playing about .570 ball. That means on any day that the Reds and Cards do not play each other, each team has about a 24% chance to gain a game on the other, and there’s a 52% chance neither team gains. When the Reds and Cards play each other, of course, there’s a 50% chance that each team gains on the other. More than twice as much. That’s why the Cards shuffled the rotation. @Dave Lowenthal- plus each game is a 2 game swing. Dustin Moseley is starting for the Yankees against Boston tonite. Carpenter has just hosed the REDS this season. He is 3-0 against the good guys with an era of 1.09. Add to that, he’s beaten the REDS 8 straight! I think it’s time to reverse the curse! They beat Oswalt this year, why not Carpenter?! Both the Cards and Marlins have an off day on Spet 20th. Chad, I concur. Its been a long, long time since I’ve been this fired up about Reds baseball. I’m driving up from SC to see 2 games in late Aug. I am not counting on a sweep, but I have to think that a five game lead this late in the season would be just about insurmountable. The good news is being 2 up and having played 2 more games than the CARDS, the REDS need only match the CARDS record from here on out and they win the division. Even if the CARDS win both of those 2 “extra” games, the best they can do is remain 1 game behind the REDS. Jordan Smith last issued a walk on July 17th, which was 10 appearances ago. The last time he surrendered a run was July 8, 11 appearances ago. On the season, he has made 20 appearances, thrown 25 innings, given up just 22 hits, has walked 4, and K’d 17. On the season, he has made 20 appearances, thrown 25 innings, given up just 22 hits, has walked 4, and KÃ¢â‚¬â„¢d 17. He’s perhaps the most pleasant surprise this year. The kids comes out of nowhere and is just masterful. I agree with Sultan. While all eyes are on this series and we’re all pumped for it, I think a lot of our season comes down to the 9 game West trip we have coming up. We need to get through that no worse than 5-4 in my opinion. It would be nice to sweep the 3 against Arizona during that trip just to make that mark a little easier. With their two highest paid players on the bench, the Reds ran out a lineup that will earn a total of roughly $4.2 million this year to take on the $144 million Cubs. I would rate the 7 game road trip to St. Louis and Colorado Sept 3-9 as the most vital stretch. We’ll be facing 3 of the NLs finest in those 7 games- Carp, Wainwright at St. Louis, and Ubaldo. I missed the game while in an airplane, enjoyed reading about it. I read the whole game thread, some good stuff there. Pricelss. Wish that could be broadcast to all of Cubs’ nation. I don’t think Jordan Smith even broke a sweat, especially in the 8th. That inning was done before it started. LVW: I agree that the 7 game road trip in St. Louis and Colorado is the scariest stretch we have coming up. The Cardinals play so well at home. Colorado isn’t playing well now but in recent years they’ve gotten hot late and if so they’ll be tough at home too. People mentioned about the Cubs not having a LHed bat. Fukodome was supposed to be that, he’s been a source of frustration to Lou. At the time it happened, a lot of us talked about the Soriano contract being a future disaster for the Cubs. It was obvious. The game’s biggest surprise by far: Gomes draws 4 walks. I’ll have to look into how that happened. I agree. And when he’s not catching, I’d like to see him used more as a PHer in such situations. Maybe in September when we have 3 catchers. I’ve been extremely confident that Jay Bruce will come around this season. Today was the beginning of his late surge. @pinson: It is amazing how many contracts that are signed, people say that is terrible and the team will regret it, that come to fruition like Soriano. Heck, just this past offseason Bay and Lyon, both awful and will be for some time. Others like Carlos Lee, Barry Zito, Todd Helton, etc… It is crazy guys get that huge of contracts after they are 30, mind blowing to me. Then teams want to complain about competitive balance. Well, it you didn’t waste a billion dollars on bad contracts then you might be able to be competitive. @BJ Ruble: Yep. And GMS seem to expect players to stay forever young, as if it were still the steriod era. Even ARod could turn into an albatross: he’s signed well into his 40’s, I believe. Very true, the steroid era definitely got the older players more money in their later years. You are starting to see teams shy away from big contracts to mid-30 guys, I think it is just the beginning of getting back to the way it was pre-90’s. Some of those guys were freakishly good in their late 30s and the sad thing is that you will never know if they did it on their own or through the needle. Some on the other hand their stat lines were so nutty, you know something was going on. Take something I saw today, Luis Gonzales got his number retired by the D-backs. That dude’s whole time with Arizona should have an asterisk. He was an OK player, but then he goes to Arizona and becomes pretty much Ted Williams for a few years. CRAZY! Maybe he just figured it out, but you got to wonder. Also on those same D-back teams was Steve Finley, who was pretty much a better player at 37-38 than he was at 27-28. I can’t give him credit to a point, as he was also on those Padres teams with Caminiti and around that same time his power took off, so it looks suspicious to me. I guess that is one thing where you look at Junior, Frank Thomas and Jeff Bagwell, who were all great in the same time period but each of them slowly broke down in their 30s in a more usual pattern and maybe give them the benefit of the doubt. Who gives a flying f___ that Derek Jeter now has more career hits than Babe Ruth ? Ruth had a career .342 average but drew 2062 walks and spent his early years as a (great) pitcher with the Red Sox. More to the point: How is passing Babe Ruth on the career hit list a landmark ? It’s not a landmark ! No one else has received publicity for career hit number 2874. 3,000 is the first career hit landmark. Jeter has now received national attention 3 times for career hit totals, and he hasn’t reached the first landmark yet. Eastern Seaboard Programming Network is always going to make a big deal on something with the Yanks. I got honked off at them this summer and haven’t watched a bit or listened to them on the radio since that whole thing with Cowhert and Votto along side LeBron. I can get plenty of sports news other places and don’t have to hear about Favre, the Cowboys, Yanks, Sox, LeBron or TO (although that is getting much more difficult with him joining the Bengals freakshow). Speaking of tough road trips, there’s also the big 9 game West Coast trip coming up. Arizona is having a lousy season but like a lot of bad teams they’re having fun being pesky in the second half. Then there’s the Giants, I’ll be at the Monday nite game. Finally the Dodgers, who give us fits in recent years. I needn’t remind the members of this blog how poorly the Reds have done on the West Coast in recent years. More and more, “recent years” seem irrelevant, as this is a good team. But that’s still going to be a big (and key) challenge. Earl: You’re right about espn, but it isn’t just them. It’s being treated as a sports story of national significance. This is the game where Rose got career hit # 2874. Bats win again, only 2 1/2 games back. I told my dad when they were 9-18, that they would still win the division, now they are finally within striking distance. GO BATS !!! They have the talent. Not much of an effort from Nady, to say the least. PS With official scoring today, it’s hard for an OFer to make an error, other than a throwing error. @pinson: It was only a matter of time. Balentien, Frazier, and Francisco started out so awful, but really turned it. Frazier a month ago was still at .219, now .253, he has been on a tear. And for those that think he doesn’t have enough power, please, he has 15 now and many times Slugger Field plays big. I have seen at least 5 of his hits that are everyday HR’s in GABP. Bats pitching has been tremendous in most games I have seen. Chapman has been 2-3 times better as a reliever and is now closing games. Danny Dorn has been very good too, still surprised nobody picked him up in the Rule V draft. The Reds have to go out and do the job on the field; but I like the way things are setting up for them at this point. As someone else pointed out the Cards have to win three more games than the Reds over the rest of season just to come even at the end because the Reds have won both the games the Cards have in hand. So while each of those games is a half game in the standings now, each becomes a whole game if the Cards lose it. And they are looking at a long trip down to Miami under adverse conditions to get the one game in. I think that look on Gomes’ face really sums up the four walks four runs PERFECTLY. Love it! I would have to imagine that leake will be the odd man out of the rotation when homer comes back. Although, leake has had a very good season he has been far from stellar over his last seven starts. His innings limit is approaching and it may make sense to use him sparingly. Homer had a great last couple months of the season last year and he may be able to provide that spark again. ESPN: The Cardinals aren’t scheduled to return to Florida, and no makeup date was announced. The most likely choice is Sept. 20, but that would mean the Cardinals would play the final 31 days of the regular season without a day off. My comment: I hope Josh Johnson pitches that game too. And, no day off, too freakin’ bad. Stop knocking Jeter, he plays the game how it was meant to be played. Hi, my name is Pete Rose. I corked my bats to pass Ty Cobb. (By the way, I love Rose as much as any Reds fan). He’s patient, but has a little power, doesn’t swing at bad pitches, can go any way and doesn’t mind a single or a BB. Gomes – swings like a madman every pitch. Cept today!!!!??? Anyone know if there’s a game today? 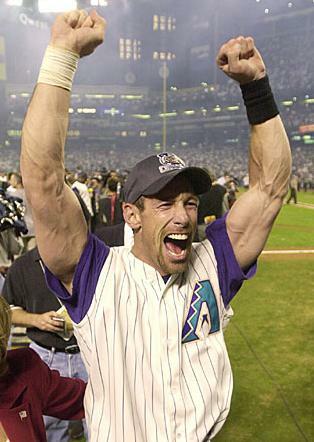 earl, I don’t wonder at all about Luis Gonzalez. Also, what a great way to go into this series! It was real nice seeing Jay Bruce hit the ball so hard, but it still looks like he’s guessing up there. I wonder if they’ve had his eyes tested (not kidding). Is it gametime yet? How ’bout now? Needless to say, I’m a little excited for this series. Bring on the Dirty Birds! The other thing I like about Hanigan is that he fought his way up through the organization..Rollins College, undrafted FA signing, played part of 3 seasons at AA….no one thought this kid could play MLB. Heck, I’d bet 90% of the Reds fans had never even heard of him when he first came up. I think the first guy I know of that got on his bandwagon was Chad…as a matter of fact. The people that commented over there did not seem to be overly optimistic about the Cards chances. I, on the other hand, don’t feel very good about these starting pitching match-ups, which means the Reds the will probably do great this series, since I have been wrong all year long. By the way there were some comments from Cards fans and writers about how Dusty has managed circles around LaRussa in past pennant races. Granted, our 3-game series with St. Louis is important but my concern is in what lies ahead. West Coast swing and I’m not talking about dance steps. That’ll be the acid test. Yeah, but I hope his vesting is still be picked. His service to the team has been invaluable and WJ has been known make that happen in the past (though I have no idea is ownership will go for it). It would show owner loyalty to a guy to is a part of why this team has been special this year. That would be Ty “Always played the right way” Cobb, who intentionally tried to end careers on the basepath, who most of his teammates hated, and the poster child of tolerance. How about that, I was totally unaware they were having a meth epidemic in St. Louis. I found out this morning my nephew is a Cubs fan. This is just unacceptable. What can be done? HeÃ¢â‚¬â„¢s seven so I shouldnÃ¢â‚¬â„¢t be too upset, but I am. Where are the child’s parents when this type of behavior exists? It may not be too late for an intervention. Send him lots of billy goat stuffed animals to soften him up. Preach: I’m not kicking Jeter, it’s about the over the top amount of publicity he gets. And one quote from Pete Rose doesn’t mean he’s a hero of mine. OhioJim: Of course the other (and traditional) view of this is that we’re just one game ahead of the Cards in the “all important” loss column. Preach: To cure your nephew, show him that “goat with braces” photo of Chad’s and tell him the goat is a Cubs fan. Or that the goat is mocking Cubs’ fans. Preach: IÃ¢â‚¬â„¢m not kicking Jeter, itÃ¢â‚¬â„¢s about the over the top amount of publicity he gets. And one quote from Pete Rose doesnÃ¢â‚¬â„¢t mean heÃ¢â‚¬â„¢s a hero of mine. Wasn’t really directed your direction. I should have put it in quotes or bolded it. I got spoiled with the “reply” feature that isn’t working for me currently. Sorry for the confusion. The Reds have had 2 players score 4 or more runs in only 9 games since 1920!! Preach: I think we’re all having trouble with the reply feature. Thanks for clarifying your Jeter comment. I like the way the guy plays – Barry Larkin with durability – and have nothing against him personally. The context of my anger is the espn mentality. espn does not report sports news, they provide entertainment and cover “celebrities” in the same fashion as E ! Mike: I remember that 23-9 game in 1977. The Reds had no bullpen, so Jack Billingham gave up 9 runs and 17 hits. pinson: I should remember the game but for some reason I don’t. The other thing I don’t remember, could this game got the Reds kick-started in 77? They clearly had a good team but looking at the boxscore it says the Reds were 5-10 at the time they played the game! They ended up 14 games over .500 and were 5 games under at the start of the season. “Votto and Gomes” compared with “Jr and Stynes”. Oh, and I hate the ‘celebrity’ thing that surrounds certain athletes too. Mike; The Reds were off to a poor start in ’77 and ultimately finished well behind the Dodgers because of one thing: pitching. Free agency began after the ’76 season, and the Reds immediately lost Don Gullet to the Yankees. Then guys like Gary Nolan and Rawly Eastwick started talking about free agency and the Reds traded them. In June they traded for Tom Seaver, but that didn’t help their rotation depth because they traded away Pat Zachry. The 23-9 game didn’t really turn things around for them. It was viewed as an angry BRM wreaking some vengeance. 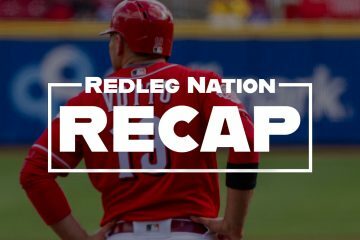 The Reds were better than their poor start and gradually gained ground on the Dodgers, who had started very hot. They got as close as 6 1/2 games out around the All Star break. But after the break their thin bullpen – Pedro Borbon and no one else – caused them to blow one big lead after another. I remember blowing a 9 (or so) run lead to the Giants. They were completely out of it by early August. They played well the final 6 weeks of the season to finish with a respectable record.